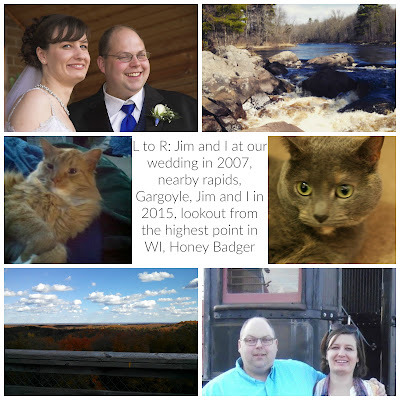 Tuesday was my husband and my anniversary. We have been married for 8 years now. That seems impossible, and then other times it seems like we've always been married. Like having my own place and living on my own seems as if it was eons ago. I think that's good. We're in that comfy groove where we say what's on our minds for the most part and harass each other but still hold hands and send each other goofy texts that are pretty much just pictures of our cats doing weird things. Usually we go somewhere for the weekend around our anniversary, but this year we didn't really plan anything. I had Tuesday and Wednesday off from work so about a week before our anniversary we really started talking about it. We finally decided to take a train ride up north with the Wisconsin Great Northern Railroad, and then just go out for supper. I booked the tickets. It was $12 a person, so not a big financial commitment, and we thought it'd be fun. We weren't really sure what to expect but when we got there, the depot was very nice and has a large gift shop with snacks. 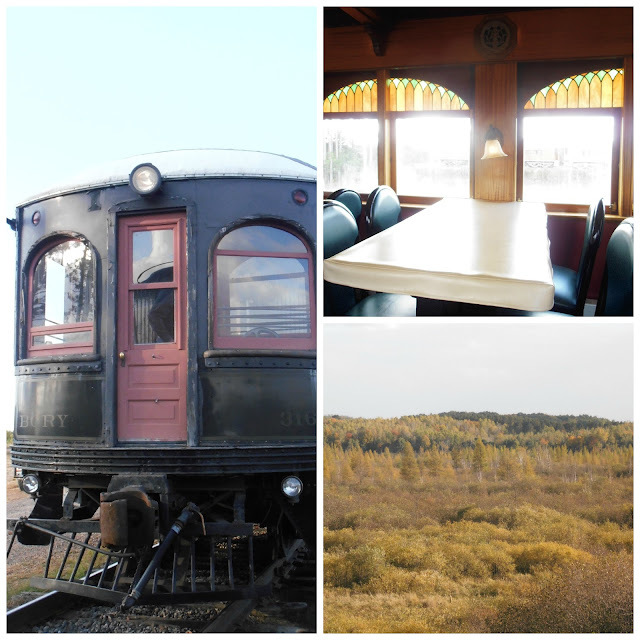 We were promptly boarded into a refurbished 1913 interurban train car, and off we went. It's only a 45 minute ride, and the fall colors weren't at their peak yet, but it was still fun. The interior of the car is pretty with stained glass a neat light fixtures, the view was still pretty, and it was something fun to do. After the train ride, we stopped back in the gift shop to get a Christmas ornament. We try to buy one every time we're on an anniversary trip, so when we decorate the tree each Christmas we have a souvenir to remember past trips by. Then we continued on north to Minong, which is about an hour south of Duluth, Minneosta (and only about five minutes north of the train depot). We didn't really have anywhere in mind to eat, but I pulled up TripAdvisor on my cell phone and we decided to try Longbranch Smokehouse and Grille. It's the number one restaurateur in Minong. (To be fair, there's only like six to choose from.) When we saw the outside, we had our doubts. It either had massive amounts of character, or was going to turn out to be a dive. We decided to live a little and give it a shot. We walked in and were immediately greeted. Our waitress was really friendly, answered any questions and was very nice. We got chips and queso cheese sauce for an appetizer and then Jim had a bacon cheeseburger and I got a pulled pork sandwich. It was soooo good! I'm not even a big barbecue lover, but the meat was super tender and the sauce was just the right amount of sweet and smokey. We loved it! If we're ever in Minong again, I'm betting we'll be back.